ROYALTY SEES ITSELF UPON THE SCREEN. The recent visit of the King and Queen to the Scala Theatre to witness the Kinemacolor pictures of the Durbar is a unique event in the annals of Cinematography. No less than eight other Royal personages, including Queen Alexandra and the Dowager Empress of Russia, accompanied Their Majesties. The following impressionist sketch is written by a member of THE CINEMA staff whose privilege it was to be present. A MOST interesting evening, and one that will live long in the memory. I had heard so much about the Kinemacolor pictures of the Durbar, but like so many others I had not yet seen them. And now that I have done so words fail altogether to express one’s feelings, as one sat comfortably in a cushioned armhair and witnessed all the grand pageantry of what was, perhaps, the greatest gathering of Indian personalities that has ever been drawn to the presence of their Sovereign. Such a feast of gorgeous colouring has surely never been seen in a London theatre before. It was all very wonderful. A short journey to the Scala Theatre, which stands on the site of the old Prince of Wales’ Theatre, reminiscent of the Bancrofts and their palmy days. The lights are turned down and we are transported to that great Indian Empire which is the envy of every other civilised country in the world. Before our wondering gaze are unfolded all the magnificence, all the splendour, all the beauty of Oriental colouring, which were so remarkable a feature of the crowning of our King and Queen in India. So perfect was the reproduction of the natural colours of the scene upon the screen that it required but little effort of the imagination to see oneself a member of that vast and orderly crowd of dusky sightseers, waiting patiently with the rays of the sun beating mercilessly down upon their heads till the Emperor of all the Indies, and his Consort, appear in the vast arena. One could almost hear the great shout of welcome from hundreds of thousands of the King’s loyal subjects as the Royal procession made its way to the beautiful canopy upon which all eyes were fixed, and Majesty seated itself upon the waiting thrones; and only a few minutes before the self-same ceremony of ushering Royalty to its seats had been enacted here before our eyes. To the Scala Theatre had come the King and Queen, with a large family party, to see once again all the glories of the great ceremony in which they had played the leading parts. In the Royal box, within a few feet of us, sat King George and Queen Mary, Queen Alexandra, the Dowager Empress of Russia, Princess Henry of Battenberg, Princess Victoria, the Grand Duchess Olga, Prince Peter, and the Duke and Duchess of Teck. Seldom, if ever, have so many Royalties been present at an ordinary performance in any theatre. The Queen wore a gown of shell pink brocade with pearl and diamond embroideries, and a diamond and sapphire tiara and necklace. Queen Alexandra was attired in dull black, but her widow’s cap was relieved in front by a small pair of diamond wings, and she wore a diamond dog collar. This, I believe was one of Her Majesty’s first appearances at a theatre since the death of King Edward. To witness the Durbar pictures in the actual presence of the King was the next best thing to seeing it in reality. Only those who were present on this memorable occasion can appreciate to the full how absolutely real the whole scene seemed. It almost lived with all its marvellous movement and sense of expansiveness, its perfect atmosphere, and its blaze of Oriental colouring, as one saw it in the company of those who had been the chief actors upon this beautiful stage. I am quite sure that everyone must have felt the same. We were near enough to the Royal box to see how thoroughly the King and Queen and their party enjoyed the novel experience of seeing themselves as others saw them. One could also clearly hear the remarks passing between the King and Queen Alexandra, who sat next to him. Owing to the Queen Mother’s sad affliction, the King had to raise his voice somewhat in order that she might hear what he said. This led to a somewhat disconcerting — although amusing — incident. Sounds of “Ssh! Ssh!” arose from different parts of the house, and it was some little time before the audience realised that it had been endeavouring to silence the King! Such remarks as floated down to us in the stalls were full of interest, and show how thoroughly human Royalty is. “Is that me?” — with the accent on the me. We heard the Queen distinctly ask the question of her Royal spouse. Then Queen Alexandra’s voice — soft and sweet — “Did you have to read something?” as the pictures on the screen showed Lord Hardinge handing a scroll to the King at the Durbar Shamiana, when the high officials and ruling chiefs did homage to their Sovereign. The scene which, however, seemed to impress the Royal visitors most was the review of 50,000 troops, and they applauded frequently as the wonderful picture of probably the most wonderful review which the world has ever seen unfolded itself. It is something stupendous, and the effect left upon the mind was one of inexpressible wonderment as to how it could all be reproduced so faithfully. Mr. Charles Urban’s Greatest Film. Of all the many pictures which Mr. Charles Urban secured in India, this is certainly the greatest and the one of which he has reason to feel most proud, for it shows more than all the others put together — fine as many of them are — how great are the possibilities of the Kinemacolor process. And mention of the inventor calls to mind the feeling of regret which was felt by all who knew the reason which prevented Mr. Charles Urban being present to share in the triumph of which this memorable evening was a fitting termination. May he soon be himself again, renewed in health and strength, to go on developing the wonderful process which he has made his own. A word in conclusion. The Royal Party came and went without ceremony. At the Scala Theatre they were received by Dr. E. Distin Maddick, and the Royal box, designed by Mr. Frank Verity, F.R.I.B.A., the architect of the theatre, was so arranged as to create the impression that the visitors were seated under the same canopy as at the Durbar. The colour scheme of the interior was pale biscuit; the roof was supported by bronze columns, and the whole was draped with a crimson valance, and decked with a profusion cf flowers and plants. As the Royal party left at the close of the performance and one made one’s way out again into the drab surroundings of Tottenham Court Road, the beautiful scenes of the Durbar floated away — away — away! But the memory of the evening with the King at the Pictures remains. Comment: Kinemacolor was a ‘natural’ colour process, managed by producer Charles Urban, which enjoyed great commercial and social success 1909-1914, in part by targeting high society audiences. The Scala Theatre in London was used as a showcase theatre for Kinemacolor. The Delhi Durbar was a spectacular ceremony held in Delhi on 12 December 1912 to mark the coronation of King George V, and was attended by the King and Queen. 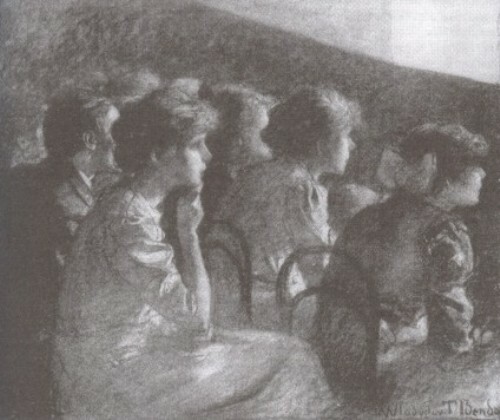 The royal couple went to see themselves on the screen at the Scala on 11 May 1912. Charles Urban had fallen ill with a perforated gastric ulcer and so missed the occasion. Edmund Distin Maddick was the owner of the Scala. The film was entitled With Our King and Queen Through India. This entry was posted in 1910s, Film journals, United Kingdom and tagged Audiences, Colour, Comfort, Documentary and non-fiction, London, Royalty, Seating, Talking, Theatres, Travelogues, With Our King and Queen Through India (1912), Witnessing oneself. Bookmark the permalink.